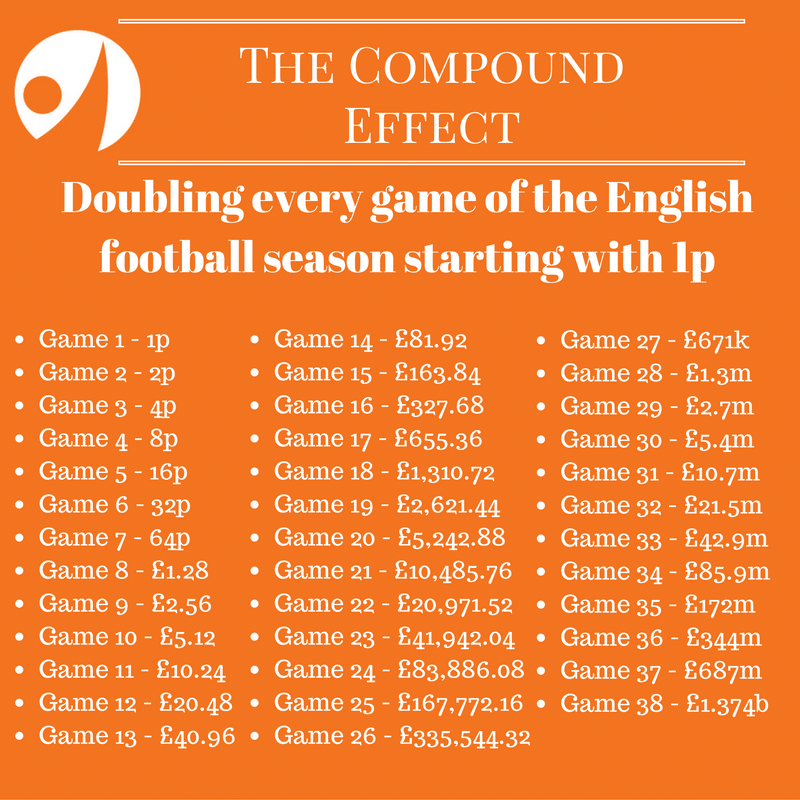 Do you understand the power of the Compound Effect? 16th November 2016 14th April 2017 Dave ColleySuccess, WealthLeave a Comment on Do you understand the power of the Compound Effect? 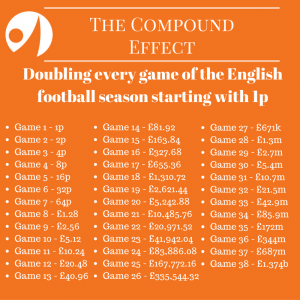 We’ve all heard about the Compound Effect, but like many things, we don’t fully understand it. I have spent some time looking at the incredible power of the compound effect and I am convinced it does not get the attention it deserves. It is something that builds incrementally, in unnoticeable margins and then one day…..well, perhaps a few examples would help. Let’s say your friend says to you, let’s bet 1p on your favourite football team to win the first game of the season. Then your friend says, but let’s double the bet every game. You think ok, so 1p, 2p, 4p, 8p. Sounds good, probably a few quid on the final game. It will keep the season interesting. Well do you know what you would be betting on the final game? Game 38 next May? Take a guess? Did you get £1.374 billion, with a “b”. 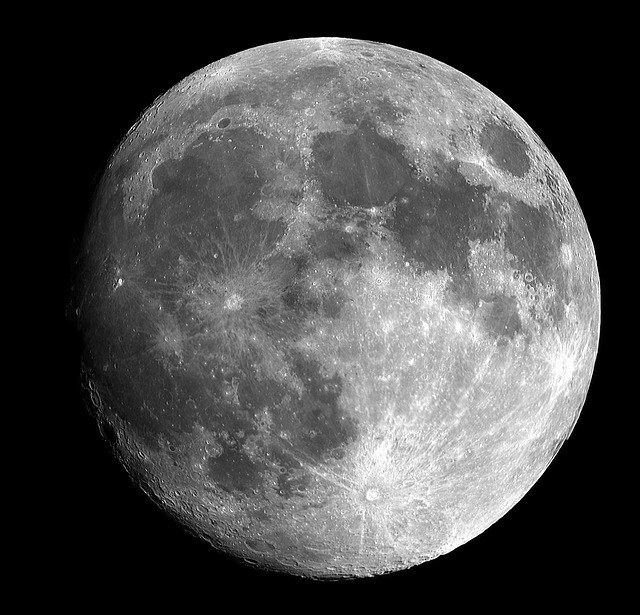 In a rocket going to the moon, you’d be 4,169 miles off (nearly twice the diameter of the moon). So it’s powerful and maybe even interesting, but how does it affect me? 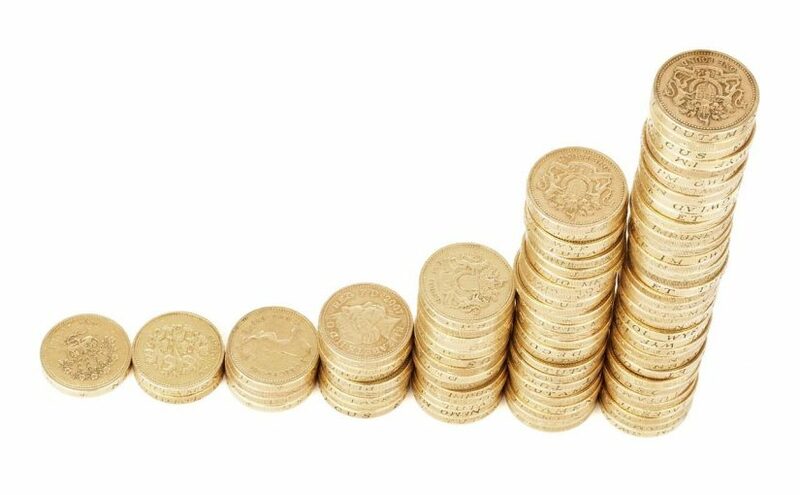 It affects your finances, your career, your weight, as it is seldom the effect of big decisions that make the difference, but rather the compounded effect of the small habits. So one more example, a personal one, I arrived in London in 2008 and when I moved to Bermuda in 2012 I had put on 44lbs (20kgs) in 4 years. That’s 11lbs (5kgs) a year, a lot, but a mere 1lb (0.5kg) a month and a trivial 0.5 ounces (14g) a day or about 100 calories. 2,000 steps or 2/3s of a can of coke. It had compounded. Fortunately I have now used the compound effect to my advantage, by instilling daily habits and I am back to my 2008 weight. Jim Rohn who is in my view the Father Abraham of personal growth and development, as evidenced by the many successful people who attribute much of their success to him, including Tony Robbins, Jack Canfield (Chicken Soup Book Series), T. Harv Eker and Darren Hardy (who has a success system based on the Compound Effect). With such an alumni, I take to heart what Jim said and I practice a few simple disciplines, habits, routines daily as I drive towards my success. To leave you with something actionable, focus on your daily habits. Find 1 or 2 to replace today, as it is easier to replace bad habits with good ones than go without. Find ways to leverage the Compound Effect to your advantage. Compound Effect – Darren Hardy, liked it so much, he wrote a book about it.